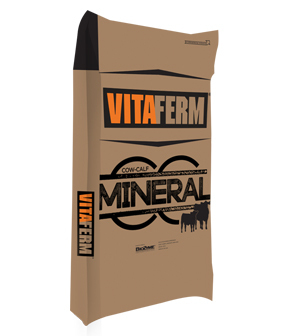 The VitaFerm® Cow-Calf Mag Mineral is an economical vitamin & mineral supplement for beef cattle that supports the health of the cow and her calf. Formulated to balance nutrients not present in lush, rapidly growing grasses and help prevent grass tetany. Provides a blend of fortifying nutrients answering the needs of the cow and calf for efficient growth and health. Formulated to balance nutrients not present in lush, rapidly growing grasses to help prevent grass tetany. Contains the Amaferm® advantage for maximum digestibility of feed. Amaferm® is a precision prebiotic designed to enhance digestibility by amplifying nutrient supply for maximum performance. It is research-proven to increase the energy available to the animal resulting in more performance. Calcium Carbonate, Monocalcium Phosphate, Dicalcium Phosphate, Magnesium Oxide, Salt, Corn Gluten Feed, Wheat Middlings, Dried Aspergillus oryzae Fermentation Product, Dried Cane Molasses, Mineral Oil, Zinc Sulfate, Manganese Sulfate, Copper Sulfate, Sodium Selenite, Ethylenediamine Dihydroiodide, Cobalt Carbonate, Potassium Chloride, Vitamin D-3 Supplement, Vitamin E Supplement, Natural and Artificial Flavor, Vitamin A Supplement. Feed to beef cattle at the rate of 4 oz. per head, per day. Free-choice salt can be provided if over-consumption occurs.